Anyway, I’ve distracted myself there and slipped back into the world of beauty, my most comfortable place, when I’m supposed to be talking about babies! (If you love beauty then do take a look at my beauty blog – it’s here: A Model Recommends.) 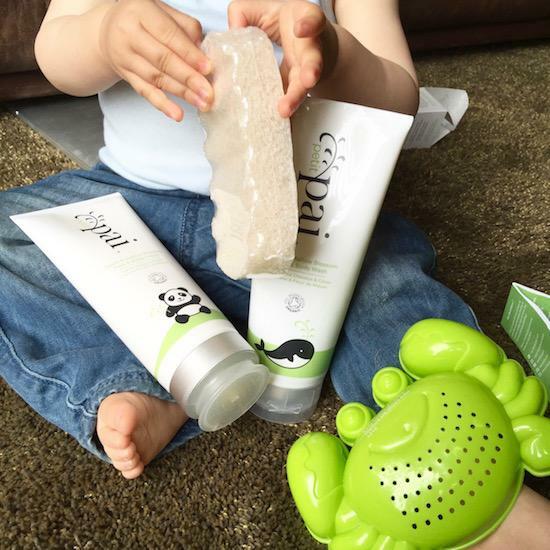 Pai have taken their sensitive skin know-how and waved a magic wand over the children’s skincare sector, introducing a small – yet perfectly formed – range called Petit Pai. Just two products; an all-over wash and a face and body cream but I suppose, really, that’s all you need when it comes to baby bathing. Both products have been formulated with the purest ingredients (Pai always list every single one so that you can see at a glance if there’s anything you’re sensitive to) and are certified organic and fragrance-free. The Apple & Mallow Blossom Face & Body Cream is intensively moisturising and contains anti-inflammatory ingredients to soothe itchy, sore skin and the Hair & Body Wash, which comes with a konjac sponge for gentle washing, is SLS free. One to try if your baby has temperamental, itchy or irritated skin – the cream can be used on areas affected by eczema and if it’s even half as soothing as the adult face creams are, I can imagine it would be a blessed relief! The Face & Body Cream is here, the Wash is here – they are priced at £20 and £18, respectively, so not the cheapest children’s products out there by any stretch of the imagination, but if you’re looking for impeccably-made baby beauty for sensitive skin then Pai should definitely be top of your list. On the beauty note, I have loads of baby products to write about (many different budgets catered for, fear not!) so I’ll get cracking on those, erm, soon.